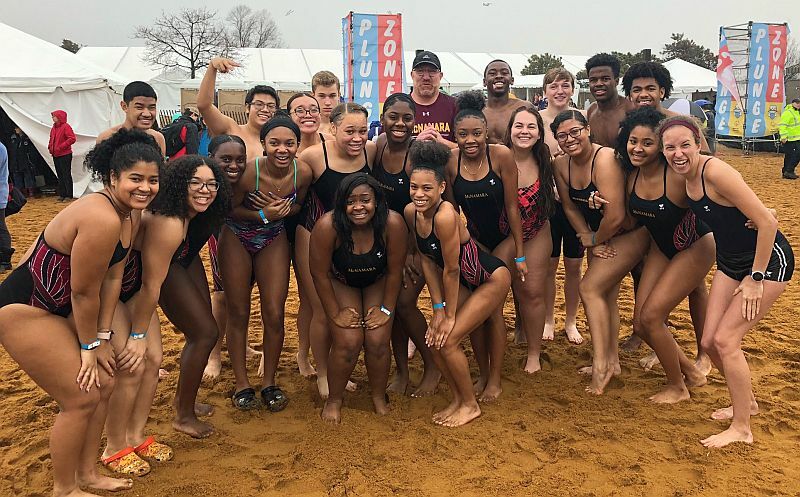 Today members of the Bishop McNamara High School Swim Team participated in the "Cool Schools" Polar Bear Plunge to raise money and awareness for the Special Olympics. "We are excited to be a part of the 2019 MSP Polar Bear Plunge! Our fundraising efforts will support the 7,782 athletes of Special Olympics Maryland. Make a donation today and help create a Maryland where opportunity is not limited by disability!" For more information or to support the BMHS Polar Bear Plunge (the donation line is still open), go to 2019 MSP Cool Schools Bishop McNamara Mustangs Polar Bear Plunge to donate on behalf of the team or members of the Swim Team. For this article and all other Bishop McNamara High School news articles, go to BMHS News. Click on Alerts icon on the BMHS news page to sign up for news in your email box or on your phone.